What are credit card Usage Guidelines? Using your ICICI Bank Credit Card is extremely simple. After making your purchase or availing of the service provided by the Merchant Establishment, present your ICICI Bank Credit Card. 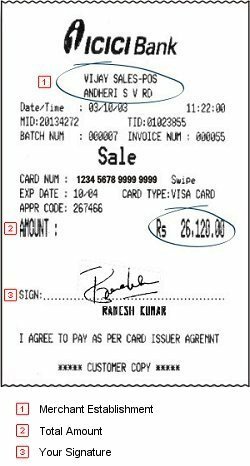 Upon processing your Card transaction, the Merchant will request you to sign a charge slip (refer to the image alongside). This contains details about the amount to be billed to your ICICI Bank Credit Card. Please check and confirm that all details have been correctly filled in. Should you wish to leave a tip or miscellaneous charge, you can do so by filling in the same on the charge slip. After filling in this section, in the interest of your own safety, we recommend that you write out the total amount in the charge slip before signing. Please ensure that you sign on the charge slip in the same way you have signed on the reverse of the Card. The Merchant Establishment will return the copy of the bill(s) and the charge slip along with your Card. Please match the amounts before leaving the establishment. It is recommended to retain your copy of the charge slip and the corresponding bill till such time as the amount is reflected in you Card billing statement. Please note: Jewellery and Electronics charges are approved selectively in the first six months of membership. For any assistance, please call the ICICI Bank 24-Hour Customer Care Centre.